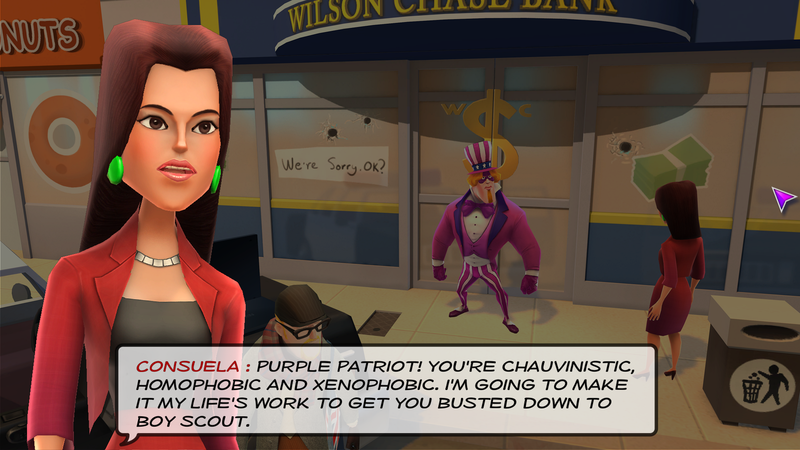 Video games are probably the last place you look for biting, political satire but that’s exactly what you’ll find with Supreme League of Patriots. From the outside it might appear that this is just a take on superheroes, and you wouldn’t be incorrect, but by far the most surprising aspect is the variety of humor that is on display here. 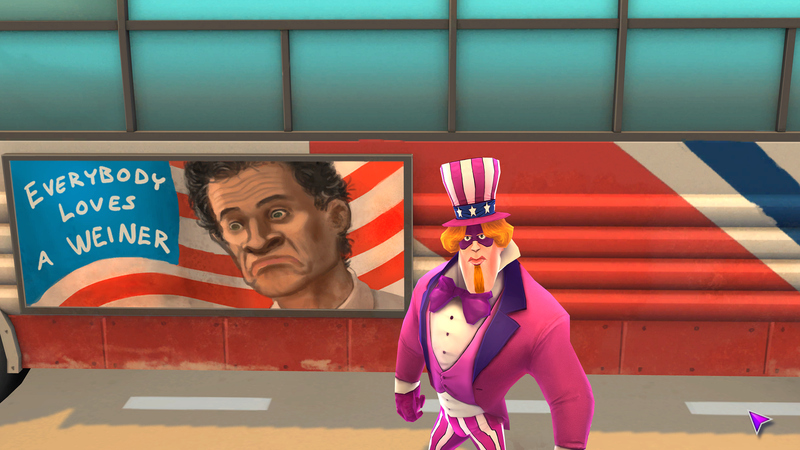 Political jokes are the main component, which is shocking to see in any type of video game. Supreme League of Patriots or “SLOP” as the game amusingly points out – is an classic point and click adventure game through and through. What carries it through its three episode first season is that it’s a smartly written comedy that doesn’t shy away from any topic, almost to the point where it could be considered offensive. Liberal and conservative points of view are taken to their extremes but not everything is about politics. Video games, celebrities, superheroes and more are all the subject of satire and jokes. The game focuses on two roommates, Kyle and Melvin. 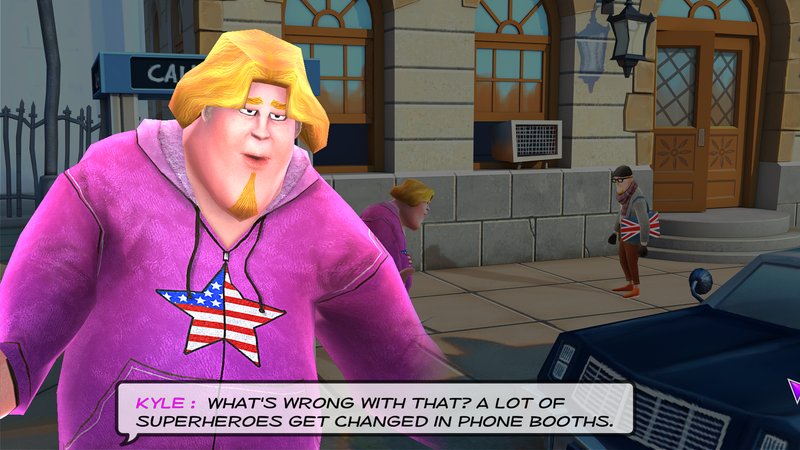 Kyle is a lazy slob who aspires to become a superhero, partly because he basically has no other discernible talents. Melvin is a self-declared illegal immigrant from Great Britain who is perhaps just as lazy as Kyle, but actually is a quite an expert with computers and hacking. While auditioning for reality show “America’s Got Superheroes” Kyle takes a series of hits to the head that lead to him developing a second personality to match his superhero persona. This persona is about as extreme right wing as a person could possibly be. This matched up against the left wing views of Mel make for the majority of the comedy in the game. The patriotic superhero that Kyle suddenly believes himself to be is where the best comedy comes from but also where the game runs into borderline offensive material. The Purple Patriot, as he calls himself, is chauvinistic, racist, xenophobic, classist, homophobic and worse. He is played for laughs and every comment is almost always immediately rebutted by every other character in the game as being moronic. Still it doesn’t change the fact that generally reprehensible views are shown that would be offensive if delivered in any other way. I personally was never offended and found most jokes pretty amusing but more sensitive people should watch out. Outside of the comedy, SLOP is a pretty basic adventure game. Clicking on an interactive item pops up a menu of actions. Kyle and his companion will comment on just about everything in the game, while prompts for “Use” or “Take” will pop up even for items that make no sense, just so that some joke can be made. Item use is a little clunky in that it makes you select an inventory item from a pop-up menu and then click on the object you want to use it on in the environment. What isn’t clunky is how the hint system works. You simply ask Mel for help in the conversation system and he will start talking you through the problem. At first his help is pretty basic but if you ask again and again he will start getting more specific until he’s practically spelling it out for you. Unlike other hint systems, it doesn’t feel like you’re cheating or taking shortcuts, it’s more like getting some advice from a friend. The only real problem I have with the game is how puzzles are solved. While most puzzles are straight-forward (albeit wacky), some times while trying to solve a problem I found I was several steps ahead of the character. I would know exactly what I needed to do by what I couldn’t figure out was how to get the characters/game to the same point I was at so I could proceed. For example, in the first episode there is a door I knew I needed to get into, and I knew that I needed to talk to the secretary for the key. However the dialogue prompt for asking about the door wouldn’t pop up until I had talked to several other characters, where somewhere it must have triggered some event that unlocked the option to ask about the key. This happens several times in the game where you have to figure out a way to get the main character to reach the same conclusion you have. The only other constant niggling problem is that Supreme League of Patriots moves slow. Originally the character movement was painfully slow; this has been patched to be faster but I still find it a little plodding. Conversations also can sometimes drudge along. The game is fully voiced and while most of the voice acting is well delivered, many of the characters speak in a slow, monotonous tone. So when a giant block of text pops up – subtitles are on by default – you have to ask yourself whether you want to sit and listen to the whole thing or just read through and skip ahead. It also doesn’t help that the game has long pauses between each individual section of dialogue, which makes all conversations feel unnatural. 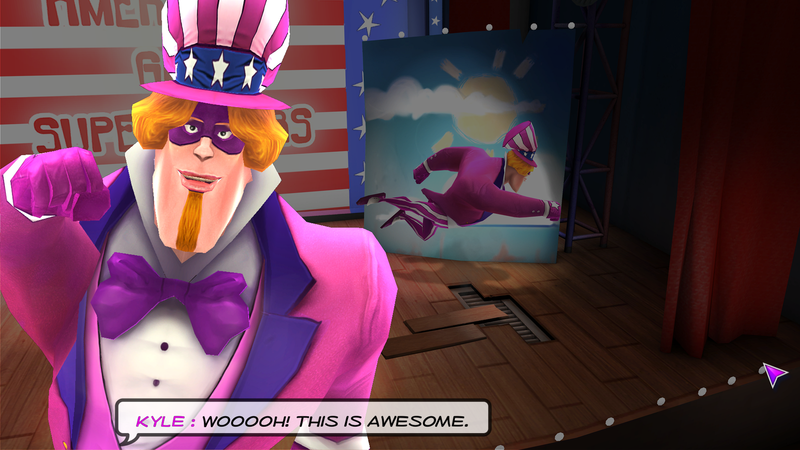 Supreme League of Patriots is a surprise of a game. I can’t think of any other game that hits political comedy as hard or as well as it does. That also means that it is not going to be a game for everyone. There are many references that went right over my head and some of the nastier comments I could definitely see offending more sensitive people. If it is your type of comedy, you will find a lot to enjoy. You can pick up each individual episode for $5.99 or the whole season for $14.99. You’ll get about 7-9 hours of gameplay and a fair amount of humor along the way. A copy of Supreme League of Patriots was provided to Pixel Related for review. Tags: No Bull Intentions, Phoenix Online, Phoenix Online Publishing, Supreme League of Patriots. Bookmark the permalink.